This edition retains the original idiosyncratic spelling and punctuation. " "These Journals are from May 14, 1804, the day the expedition left the Mississippi River, to September 26, 1806, a day or two after they arrived back in St. Louis. 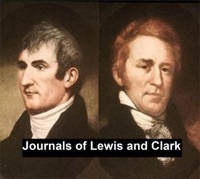 It includes all possible Journal entries of Lewis and Clark. Most of the "courses and distances" and "celestial observations" have been omitted. The notes and most of the corrections of past editors have been removed. "According to Wikipedia: "The Lewis and Clark Expedition (1803–1806), headed by Meriwether Lewis and William Clark, was the first American overland expedition to the Pacific coast and back."